The menu is built automatically from the site map. If you wish that a page does NOT appear in the menu just delete the page name. The menu is a plus. You can create your own menu with links in other elements (images, text, etc.) without using the automatic menu. If a page contains children pages defined in the sitemap, it can be taken as the root of the menu that will show only the pages descending from this root. In a hierarchical site structure, depth is the number of inferior levels that the menu is able to open in sub-menus. The menu takes the width it is allocated by the browser on the page; to reduce it to a more useful size, it is possible to assign an alignment "include below on the left" or "include below the right”. This is preferable for a vertical menu, so that the sub-menus appear correctly. 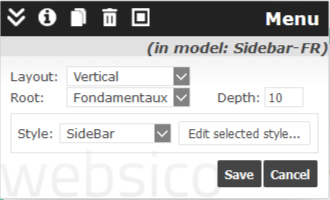 In a hierarchical structure the menu will automatically open the submenus cascaded to the most appropriate place according to available space, with a preference to the right. The link to the current page can be highlighted in the menu by assigning particular appearance values (on the line "Apply to links" select "Link to the current page" in the settings window).